The new book “Penguin Bloom: The odd little bird who saved a family” is a true story of hope and courage. It begins with a shocking accident, in which our friend and mother of three, Sam Bloom, suffers a near fatal fall that leaves her paralysed and deeply depressed. Into their lives comes Penguin, an injured magpie chick abandoned after she fell from her nest. 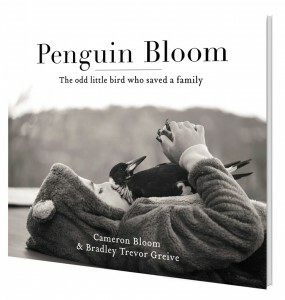 The book features Cameron Bloom’s exquisite photography and is written by New York Times Bestselling author Bradley Trevor Greive. We are honoured that the Blooms, the author and the publisher are all donating 10% of their royalties to research! Cam’s photo-journal of Penguin is a global Instagram sensation; see it here.